Engineers will deliver a full-fibre network for homes in Clyans Wood, Monymusk. All 44 households on the Clyans Wood development missed out when fibre broadband at speeds of up to 80Mbps (megabits per second) reached the village – because the upgrade was planned before their homes were built. But now they’ll leap ahead with a bespoke fibre-to-the-premise (FTTP) network which is capable of providing ultrafast speeds of up to 1Gbps (gigabits per second)*- around 24 times the UK average speed and enough to stream 200 HD Netflix movies simultaneously. The cost will be covered by investment from Openreach and the residents themselves, who set up a crowdfunding scheme to raise their share of the funding. Clyans Wood resident Roger Esson launched the appeal on the crowdfunding service Spacehive – which raises cash for projects that improve local environments. Within two months, the community raised the £8,700 needed to co-fund the project with Openreach. Roger, who has recently taken on a senior management role with The Oil & Gas Technology Centre (OGTC) in Aberdeen, said: “In a 21st century connected home where you’re running TV and music over the internet, working from home and trying to upload to cloud-based services, you need fast, reliable connectivity. “The houses over the road had speeds that were 10 times faster, but we were not in any upgrade plans because our postcode didn’t exist when they were drawn up. It was very frustrating and seemed beyond our control. Roger also secured support from the site’s developers, Kirkwood Homes, and factors, The Property Management Company, which both contributed to the fund. Robert Thorburn, Openreach partnership director for Scotland, said: “It’s great that we’ve been able to work with the Clyans Wood community to find a broadband solution and I congratulate Roger and the residents on their successful Spacehive campaign. It shows what can be achieved when people work together towards a common goal, and we’re proud to be part of that. “Partnerships like this help us to bring high-speed connections to those areas that, for many reasons, broadband providers struggle to upgrade alone. Independent data shows that more than 92 per cent of Scotland can access superfast speeds today, and we’re committed to making fibre broadband as widely available as possible. The Community Fibre Partnership scheme is designed to help people in places not included in any current roll-out plans to bring fibre broadband to their local area, working with Openreach to co-fund the installation. If a local school benefits from the project, communities can also benefit from a BT Group grant that will cover up to 75 per cent of the cost, capped at £30,000. 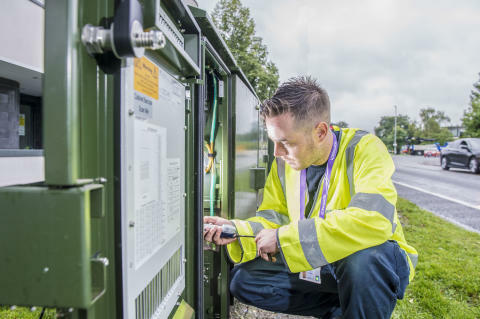 Once the network is in place, typically within 12 months, communities have access to a range of providers who offer their services over the Openreach network, bringing competition and choice. Across the UK, more than 400 CFP schemes have already been agreed, with upgrades complete in more than 200 communities. Once Openreach has installed the infrastructure, residents can place an order for the new faster services with a provider of their choice. *These are wholesale speeds available from Openreach to all service providers; speeds offered by service providers, and attainable over individual lines, may vary. FTTP is capable of delivering the fastest residential broadband speeds in the UK – up to 1Gbps. Crowdfunding is based on the idea that a number of people can split the cost of something – in this case fibre broadband – with multiple people contributing, rather than any one person footing the whole bill.